As All Saints day approaches, here’s something I wrote about a woman who (while not officially a saint) helped me a lot about five years ago – although she died 100 years ago. I was in the city for a meeting recently and when it was finished I used the opportunity to visit St Patrick’s at Church Hill and the Portico bookshop nearby. The day ended up being like a mini retreat or a pilgrimage, which was perfect, though unintended. At the bookshop, after a while of browsing and seeing nothing jump out at me I started to feel self-conscious. I decided I really had to get something worthwhile or I would have wasted precious free time on my one child-free day out. I had a vague idea that I wanted some encouragement as a wife, a mum, someone just trying to make good use of my life. It was too vague and this was the problem! I started scanning every shelf, high and low, feeling ridiculous as there were plenty of interesting books on offer. Finally, in desperation, because I had spent way too long there, I started backtracking. I went back to the saints section, with a thought that there might be a new book on St Therese of Lisieux or Mother Teresa (St Teresa of Calcutta) that I had missed. 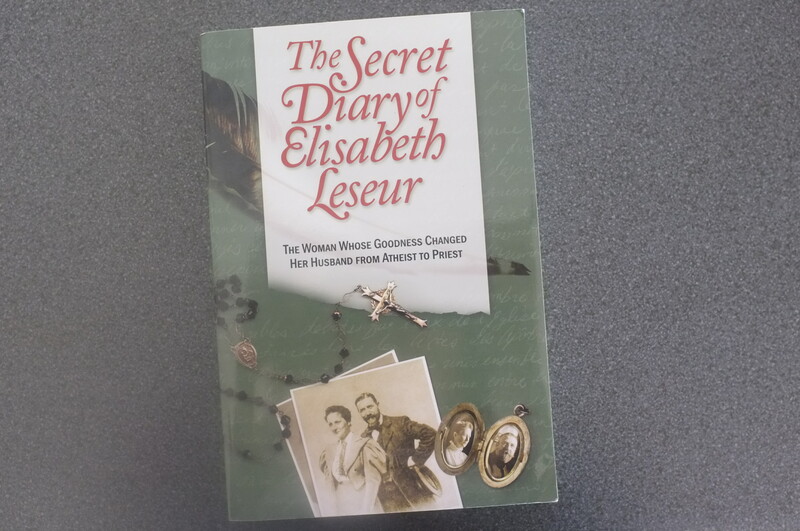 Now I know why I had to go over the store with a finetoothed comb, because I would never have noticed the shelf which held the intriguingly titled The Secret Journal of Elisabeth Leseur. It is exactly the book I needed to read. Elisabeth lived in Paris and was married to Dr Felix Leseur, a medical doctor who, although a cradle-Catholic, became editor of an anticlerical, atheistic newspaper. Dr Leseur eventually had a change of heart and even became a Dominican priest after Elisabeth’s death. The reason for this is revealed in his wife’s journal. Elisabeth began her journal in 1896 when she was in her 30s to make note of the “evolution” of her soul and to jot down the thoughts and desires she had in prayer, to list her resolutions and plan her Lenten observances and retreats. Her journal ended in 1914, the year she died aged 48. It reads as though it could have been written yesterday. She seems to have reached the heights of contemplative prayer while living a happily married life full of work, entertaining, travel, and various occupations. There are striking parallels in the spirituality of Elisabeth (she is officially a Servant of God) and St Therese of Lisieux. She had a similar ‘little way’ of love and suffering to St Therese, but began following it much later in life (a fact I personally found consoling, and still do!). This All Saints day I am reminded to take up again my friendship with the saints I feel an affinity with, to befriend one or two new ones, and thank all the saints for their constant intercession on our behalf. As for Elisabeth herself, I hope that one day soon she is proclaimed a saint so that she becomes more widely known. I think her example and teachings are very relevant and necessary today, particularly for lay women. Next Post Want to draw some peace into your parenting? You could start with Sundays.